Torre en Conill is a luxurious urbanization situated in Bétera, close to the Escorpión golf club. The exclusive and tranquil development is 1.5 kilometres from the centre of Bétera (which has 21,000 inhabitants) and is just 12 kilometres northwest of Valencia centre. The fabulous Mediterranean beaches are located 20 kilometres away and are easily accessible by car. Torre en Conill is ideally located close to the golf courses, with its exclusive houses and chalets laid out around the spectacular 27 hole Escorpión golf course. The course is distributed into 3 characteristic groups of 9 holes thereby allowing different 18 hole rounds. The carefully designed Ron Kirby course is accentuated by its stunning location at the foot of the Sierra Calderona, benefiting from the beauty of Mediterranean vegetation, uneven terrain and numerous lakes. Thanks to the development’s excellent location, all necessary amenities can be found in close proximity. Within the urbanization itself one can find a supermarket, and the neighbouring development, Mas Camarena, is home to a prestigious bilingual school of the same name. Sailing fans will also be satisfied with the close proximity of several ports including Port Saplaya (Alboraya), Port America’s Cup (Valencia) and Pobla de Farnals port, all found within a 20 kilometre radius. Furthermore the development offers an equestrian centre and 24 hour security. A bus line connects Torre en Conill with Mas Camarena, Bétera and Valencia, and there is also a metro stop for the line 1 which enables travel to and from the city without the need of a car. 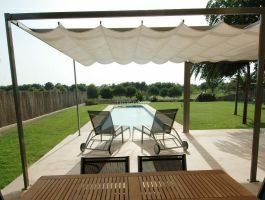 Browse Torre en Conill property for sale listings.